offers highly efficient and economical corrosion protection for Automotive applications. Cortec® products have been developed using proprietary VpCI® Technology. severe damage caused by corrosive process streams. VpCI's offer an environmentally safe method of treatment with low toxicity and low polluting effects. Unlike corrosion inhibiting systems of the past, many of Cortec® VpCI's do not contain chromates or other heavy metals, nitrites, or chlorinated hydrocarbons. With Cortec® VpCI's you can turn the tables on corrosion. With the support of our corrosion scientists, engineers, and testing facility, Cortec® can provide simple, environmentally friendly, cost-effective solutions to corrosion problems. FEATURED IN: Cortec Releases Bio-Based Ecoline for General-Purpose Lubrication Featured in Auto Parts Magazine! NEW PRODUCT RELEASE: EcoLine® Fifth Wheel Grease! NEWS ALERT: CortecRus and Cortec® Corporation presented VpCI® Technology at the Seminar Organized by KAMAZ! FEATURED IN: Cortec Develops Water-Based Coating to Protect Metal From Rust, Abrasions Featured in Automotive Magazine! 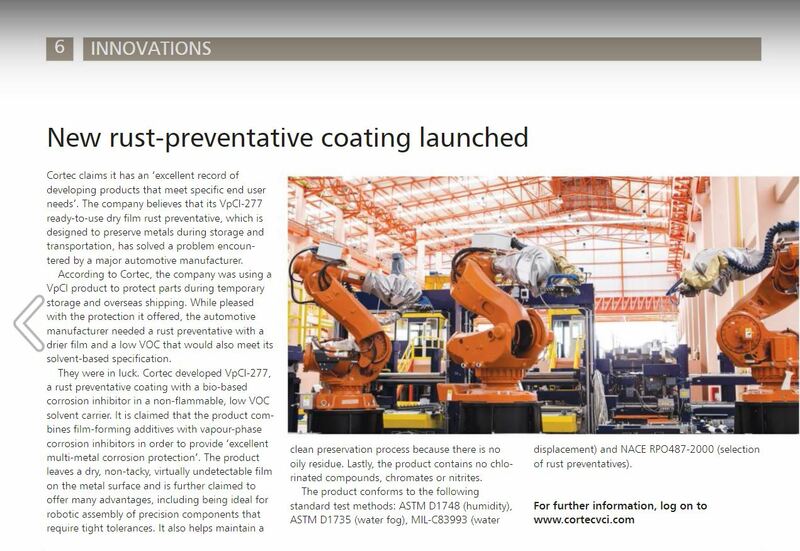 FEATURED IN: New Rust Preventative Coating Launched Featured in Steel International Magazine! NEWS ALERT: Cortec’s Complete Replacement for Temporary Oil-Based RPs Featured in Industrial Equipment News! FEATURED IN: Dry Film Rust Preventive Designed for Tight Tolerances Featured in Material Performance Magazine! FEATURED IN: Cortec® Develops Specialized Ready-to-Use Rust Preventative Ideal for Tight Tolerances Featured in SMT Magazine! FEATURED IN: Ready-to-Use Rust Preventive Suitable for Tight Tolerances Featured in Fabricator Magazine! FEATURED IN: Company Overview of Cortec Corporation Featured in Bloomberg Magazine! FEATURED IN: EcoAir VpCI-337 Fogger Featured in School Bus Fleet Magazine! FEATURED IN: Cortec Rolls out Ready-to-Use Rust Preventative Featured in Gulf Construction Magazine! FEATURED IN: Cortec Rolls out Ready-to-Use Rust Preventative Featured in Trade Arabia Magazine! FEATURED IN: Cortec VpCI-706 Fuel Additive Featured in Vehicle Service Pros Magazine! PRODUCT RELEASE: Cortec® Develops Specialized Ready-to-Use Rust Preventative Ideal for Tight Tolerances!and Systems! FEATURED IN: Ecosonic Electronic Cleaner/Protector powered by Nano-VPCI Featured in Vehicle Pros Magazine! 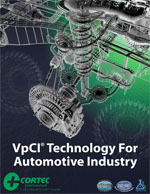 FEATURED IN: VPCI-368 EVP Coating Featured in Vehicle Service Pros Magazine! FEATURED IN: Cortec Super Barrier EcoShield VpCI-144 paper Featured in Power Transmission Engineering Magazine! FEATURED IN: Cortec Acquires CorteCros Featured in Power Transmission Engineering! FEATURED IN: Cortec Acquires CorteCros Featured in Gear Technology Magazine! FEATURED IN: Cortec VpCI®-389 Temporary Coating Featured in Vehicle Service Pros! FEATURED IN: Cortec Dunnage Bags Offer Shipping Protection Featured in Power Transmission Magazine! FEATURED IN: CorrLube VpCI Lithium EP Grease Featured in Bearing News! FEATURED IN: Cortec VpCI®-389 Temporary Coating Featured in Engine Builder Magazine! FEATURED IN: Cortec's EcoAir® Featured in Engine Builder Magazine! FEATURED IN: Cortec's Corrosion Protection Line Has Water-Based Spray Can Technology Featured in Auto Service Professional Magazine! PRESS RELEASE: Cortec's CorShield® VpCI®-148 Oil And Grease Resistant Paper Powered By Nano-VpCI™ Solves Corrosion Problem Of Leading German SUV Manufacturer! FEATURED IN: BioCorr® Receives EU Trademark Approval Featured in Food Production Magazine! FEATURED IN: BioCorr® Receives EU Trademark Approval Featured in Packaging Europe Magazine! PRESS RELEASE: BioCorr® Receives EU Trademark Approval, Strong on Corrosion - Gentle on Nature - Easy on the Wallet! FEATURED IN: Cortec EcoClean VpCI- 432/433 Featured in Automotive Magazine! PRESS RELEASE: Multi-Metal Corrosion Protection Emitter Featured in Automotive Products Magazine! 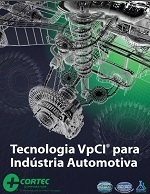 PRESS RELEASE: Cortec's New Automotive Brochure Now Available!